Look, look, look what three tiny mice have found. A postcard with a painting entitled “Portrait of Lady Clopton” by Robert Peake on the front. They look, look, look at the painting and see that it has patterns, colors, lines, and shapes. As they keep looking and seeing, they experiment with paper, scissors, and markers, experiencing the excitement that comes with creative thinking and doing. 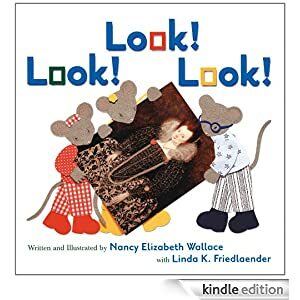 Children will be inspired by this introduction to art and observation, illustrated with Nancy Elizabeth Wallace’s signature paper-cut artwork. A glossary and postcard activity reinforces lessons learned throughout the book. Young readers ages 5-8 will want to read this book that is selling for 99 cents today. Click here to purchase Look! Look! Look!